The monkey warrior, Hanuman, whose tail stretches for miles and whose voice rings like thunder. He jumped from India to Sri Lanka in one leap and has the power to seize the clouds and tear trees from the ground. 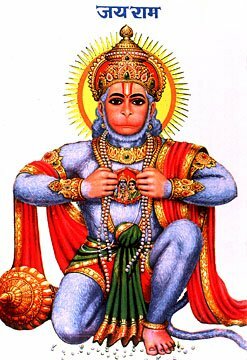 He shows Rama and Sita in his heart - he was a follower of Rama and helped to find Sita in Sri Lanka. He is the son of the wind god.